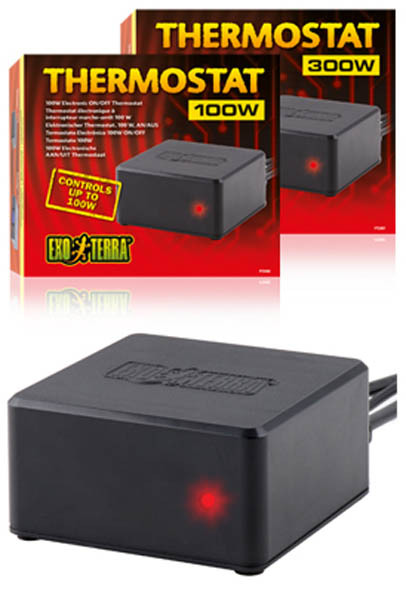 Exo-Terra Electronic ON/OFF Thermostats are used to accurately control terrarium temperatures. They are ideal for use with Heat Mats, Heat Cables and Ceramic Heaters, for controlled temperatures between 68°F – 95°F (20°C - 35°C). The waterproof remote sensor accurately monitors temperature where placed in the terrarium. * Two models 100w and 300w. * Can be used with the following heating sources: Heat Mats, Heat Cables, Ceramic Heaters, etc.